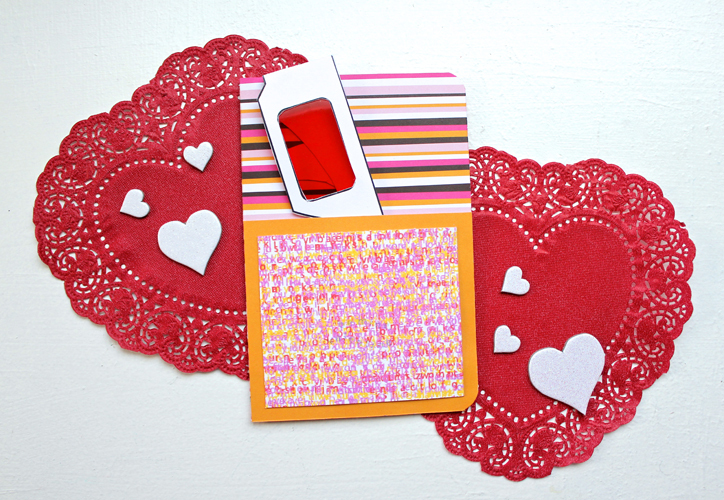 Project Description: Make invites or Valentines super special with a secret message and decoder glasses. In order for this to work properly, you must print on the same sheet of paper twice. Begin by printing the free Decoder Background page. Next choose which secret message you’d like to print. Feed the same sheet of paper through the printer, using the same orientation you did when you first printed on it. The text will print in blue but will be illegible. Finally, print the Decoder Glasses Template on card stock. Cut out the glasses on the dark lines. Remove the red rectangles. The trick to the decoder glasses is a transparent red film. This film is called Clear-Lay and is made by Grafix. They make several colors, but you must use red for this to work. Cut two rectangles from red Clear-Lay and adhere them to the back side of the glasses. I prefer to use glue dots for this. Fold on the glasses’ dotted lines to create tabs. Attach the stems of the glasses to these tabs. To make this card, begin by cutting patterned paper to 6 x 8 inches. Fold in half to make a card that’s 6 x 4 inches. Cut a square of coordinating paper to 4 x 4 inches. Trim the decoder paper to 3.5 x 3.5 inches and adhere to the larger square. Add a border of adhesive on the back side of the square, along the two sides and the bottom. Leave the top unglued to create a pocket. Adhere the square to the bottom of the card. Trim the corners with a corner rounder punch if desired. Side the glasses into the pocket.